Glass is a transparent material. To draw a glass object you can use colored paper. In this case you need to use white pastel or a white pencil, or you can slightly tone the paper with charcoal (as shown in the video). The surface of the glass object is full of reflections and highlights, you need to carefully analyze the reflections that you see and pick the ones that seem important. Transparent object needs to be constructed very well, otherwise the object drawn will look shapeless and foggy. Give special attention to the tonality. Make many sketches of simple glass objects with different lighting. 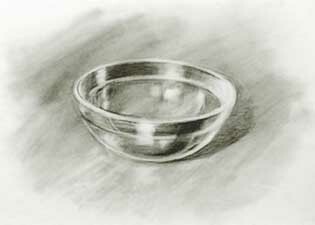 A sketch of a glass bowl. 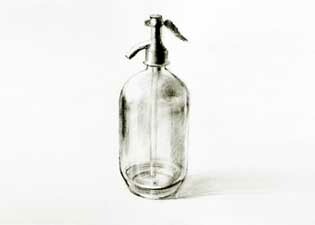 A sketch of a glass bottle.